This entry was posted on July 16, 2014 by Laney. 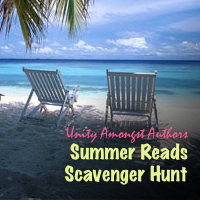 It was filed under BLOG HOPS, Giveaways, TIED and was tagged with Author, blog hop, Book Giveaway, Fiction, Giveaway, laney mcmann, summer reads scavenger hunt. Opposition is definitely #1 on my Summer Reading List, I’ve been waiting for it forever! Across the Universe by Beth Revis is next up on my list. I’m making a point to read The Ashes Trilogy! Let’s Get Lost is on my list! if it’s open to international ( even only the bookmarks) i would love to be entered. I’m currently reading an ARC of Shatter by Erin McCarthy. Loving it! though that’s technically a re-read 😉 but was just amazing!!! I am currently reading Before You by Amber Hart. Thank you for the giveaway! I am aiming to read the Outlander series by Diana Gabaldon this summer. 6 more books to go! I really want to read Opposition by Jennifer Armentrout!!! I am really looking forward to Opposition as well!!! I don’t want the series to end! Dark Skye and Ugly Love are two of many books I want to read this summer! Name link not working – jennybeesbookblog.wordpress is the correct one. I’m dying to read City of Heavenly Fire by Cassandra Clare right now. To All the Boys I’ve Loved Before is on my to-read list this summer. Thanks to everyone who entered Lisa Amowitz’s Swag giveaway! Wow. All the entries have been tallied and Random.org has chosen the winners. Check your emails. 😉 The Grand Prize winner has also been chosen. The winner’s name is up on the Summer Reads Scavenger Hunt blog. Thanks again for playing!